Generates lightning bolts between two points, and renders them over a background. Increase the number of bolts to give a electrical plasma effect. Increase Vary Endpoint to spread out the ends of the bolts. Adjust the Glow Color for differently colored results. The Wiggle Speed parameter causes the bolts to automatically undulate over time. Effect: Popup menu, Default: 2D . Selects between 2D and 3D modes. 2D: creates a zap along a spline. 3D: creates a three-dimensional zap. Bolts: Integer, Default: 1, Range: 1 to 1000, Shared . The number of lightning bolts to draw, each between the Start and End location. Start: X & Y, Default: [-0.5 0.546], Range: any, Shared . The starting point of the bolts. End: X & Y, Default: [0.5 -0.565], Range: any, Shared . The end point of the bolts. This parameter can be adjusted using the End Widget. Vary Endpoint: Default: 0, Range: 0 or greater, Shared . Offsets the End location by a random amount within a circle of this radius. If Bolts is greater than 1, this can be useful to spread out the different End points. For example, you can create multiple radiating bolts by increasing this radius and placing the End point near the Start point. This parameter can also be adjusted using the End Widget, after it is made positive. Width: Default: 0.07, Range: 0 or greater, Shared . Vary Width: Default: 0, Range: 0 to 1, Shared . End Pointiness: Default: 0.1, Range: 0 to 1, Shared . Wiggle Start: Default: 0, Range: 0 or greater, Shared . Wiggle Speed: Default: 1, Range: 0 or greater, Shared . Rand Seed: Default: 0.123, Range: 0 or greater, Shared . Wrinkle Amp: Default: 1, Range: 0 or greater, Shared . Curve Amp: Default: 0.5, Range: 0 or greater, Shared . Branchiness: Default: 1, Range: 0 to 20, Shared . Branch Angle: Default: 65, Range: 0 to 180, Shared . Branch Length: Default: 0.5, Range: 0 to 3, Shared . Start Offset: Default: 0, Range: 0 to 1, Shared . Length: Default: 1, Range: 0 to 1, Shared . Glow Bright: Default: 2, Range: 0 or greater, Shared . Glow Color: Default rgb: [0.5 0.5 1], Shared . Glow Width: Default: 0.2, Range: 0 or greater, Shared . Glow Width Red: Default: 0.5, Range: 0 or greater, Shared . Glow Width Grn: Default: 1, Range: 0 or greater, Shared . Glow Width Blue: Default: 1.5, Range: 0 or greater, Shared . Atmosphere Amp: Default: 0, Range: 0 or greater, Shared . Atmosphere Freq: Default: 1, Range: 0.1 or greater, Shared . Atmosphere Detail: Default: 0.6, Range: 0 to 1, Shared . Atmosphere Seed: Default: 0.123, Range: 0 or greater, Shared . Atmosphere Speed: Default: 1, Range: any, Shared . Point 1 Enable: Check-box, Default: off. Turns on or off the first control point. Control Point 1: X & Y, Default: [-0.33 0.4], Range: any. Point 2 Enable: Check-box, Default: off. Turns on or off the second control point. Control Point 2: X & Y, Default: [0.1 0.25], Range: any. Point 3 Enable: Check-box, Default: on. Turns on or off the third control point. Control Point 3: X & Y, Default: [0.4 0], Range: any. Point 4 Enable: Check-box, Default: off. Turns on or off the fourth control point. Control Point 4: X & Y, Default: [0.45 -0.33], Range: any. Swivel Zap: Default: -45, Range: any. In 3D mode, rotates the lightning left or right about a vertical axis. Tilt Zap: Default: -15, Range: any. In 3D mode, rotates the lightning up or down about a horizontal axis. You can use Swivel and Tilt together to rotate about arbitrary diagonal axes. Camera Zoom: Default: 0, Range: -5 to 1. In 3D mode, zooms in or out on the lightning. Glow Fade: Default: 0.2, Range: 0 or greater. In 3D mode, fades out the glow on more distant parts of the lightning. Selects what the effect will output. 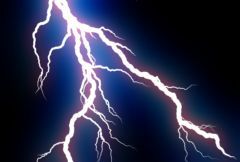 ZBuffer: shows a depth map of the lightning which can be used for compositing or to control other effects.